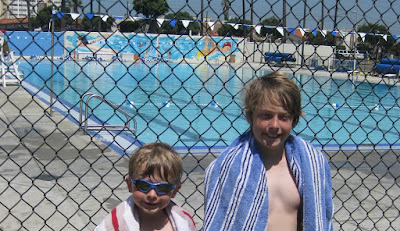 The boys have swim lessons every weekday during the month of July at the local public pool in our city. This is the same pool (called "the Plunge") where my parents swam when they were kids, and where Michael and his siblings swam in their youth. My Dad told me my mom used to go to the Plunge to meet boys. Evidently, she met the best boy of all (my Dad) and then gave up swimming. I don't have a single memory that features my Mother in a swimsuit! In my childhood we lived in a neighborhood where our house was the only one without a pool. 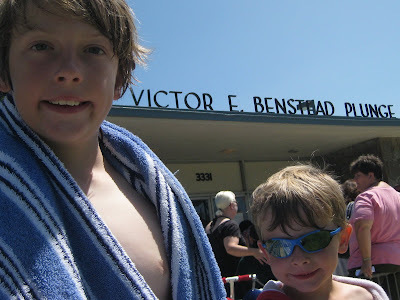 My little brother and I would suit up, grab a towel, and go door to door during summer to find someone willing to let us swim, unsupervised, while the occupants went off to work. We always found someone happy to let us use their pool. Things have changed quite a bit since then, huh? This year, the boys are in two separate sides of the pool. I sit in the center on the viewing deck and whip my head back and forth to see Ben swim and then Nathan. I confess that most of the time I sit with book in hand and enjoy the relative quiet of forty minutes of peaceful reading while the parents around me video tape and photograph their child's every splash. Ah, the plunge. I'm guessing they don't still have the same swim class levels that they had when I was a kid - guppies, minnows, and sharks ;).